When Kadeidra “KD” Bramwell’s father was deported to Jamaica, her family was turned upside down emotionally and financially. Her mother, a hard worker who held down minimum-wage jobs, supported KD, then age 5, and her two older siblings. Over time, tight finances choked the household, and KD’s family spiraled into homelessness. The family bounced from the homes of friends and family over the course of six years. Corresponding to the moves from one home to another were moves from one school to the next, further adding to the family’s instability. This was particularly hard on KD because she was bullied at school. The other kids noticed her “lack of things,” as she put it – her old, worn-out clothes and shoes – and the bullies made her life painfully difficult. Difficulty took on new meaning when KD’s mother found herself in a physically abusive relationship, while her children suffered emotional abuse. The family finally escaped to Women in Distress, where caring staff helped them reboot and put them on a path to normalcy. They addressed their immediate need for shelter and then helped KD’s mom find a job and an apartment. By this time, KD was heading into her last few years of high school at Boyd Anderson, where she found her stride. She learned competitive drive, teamwork and determination as an impact player on the girls’ basketball team. She worked hard and earned top grades, eventually graduating with honors in the top 10 percent of her class. She was the only one among her siblings to earn a high school degree. Upon graduation, KD registered at Broward College to pursue a computer science degree. She quickly realized she wasn’t suited for computer work and switched to marine management, where she thrived. She figured out her finances to get through college with scholarships and financial aid support. In addition to receiving the Broward College Merit Tuition Scholarship, she received support from Salute to Education Inc., Supplemental Education Opportunity Grant, and Florida Student Assistance. Now 23 and a resident of Fort Lauderdale, KD earned an Associate of Science Degree in Marine Engineering Management in December of 2017. She is proud to be the first in her family to graduate from college. She also earned six American Boat & Yacht Council (AYBC) certifications, critical to success in the marine industry. KD recently landed a position as engineering supervisor at Fort Lauderdale Water Taxi, where she’s charged with keeping the company’s 13-boat fleet in top working order. KD is enjoying finding success in an industry dominated by men. 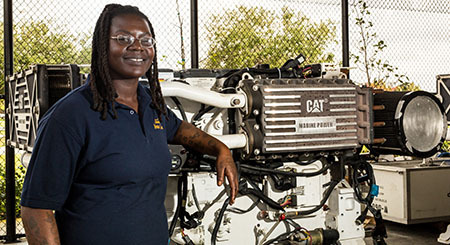 Reflecting workforce statistics, fewer than five percent of students currently enrolled in the marine program at Broward College are women. As the only woman engineer at Water Taxi and its first female, African-American supervisor, KD especially loves the competition. “Plus, I like bossing around the guys,” she said with a smile. The Jerry Taylor & Nancy Bryant Foundation gifted $1.9 million to Broward College to support aviation and avionics education at the college’s Emil Buehler Aviation Institute. The gift, intended to ignite student enthusiasm for the study of aviation and create a pathway to propel them to success, establishes the Taylor-Bryant Avionics Honors Scholarship, supports the expansion of a new hangar where an avionics line lab will be housed, and funds further development of a bachelor’s degree program in aerospace science and an associate degree in avionics. We believe providing the opportunity education makes possible to those who can benefit from it the most is crucial to our community’s future. We believe in providing the opportunity of education. Learn how the Broward College Foundation is making the American Dream a reality for students. Learn more about the many ways you can contribute to the Broward College Foundation.